These gluten free oatmeal chocolate chip cookies are crunchy on the outside, chewy in the middle, and full of the rich flavours of chocolate and coconut. Make a double batch ’cause they won’t last long! Oats lower cholesterol, are an excellent source of plant protein, and good source of iron. However, not everyone who has celiac disease can tolerate them, even when the oats are gluten free. If you have questions, talk to your physician or dietitian. In large bowl, mix the butter and sugar together. Beat in the eggs, one at a time. Then add vanilla. In medium bowl, sift together the flours, xantham gum, baking powder, and baking soda. Add to first mixture and blend. Now blend in the oatmeal, coconut, and chocolate chips. TIP: If the batter is too soft, let it sit for five minutes so the coconut flour can absorb some of the moisture. If you are using a different all-purpose flour and find that the mixture is too stiff, add another egg. Drop by spoonfuls onto the baking sheet. These cookies will flatten on their own so leave quite a bit of room around them. Bake for 8 to 10 minutes or until golden brown around the edges. This entry was posted in Baking, Recipes and tagged coconut flour, cookies, gluten free, oatmeal. Bookmark the permalink. 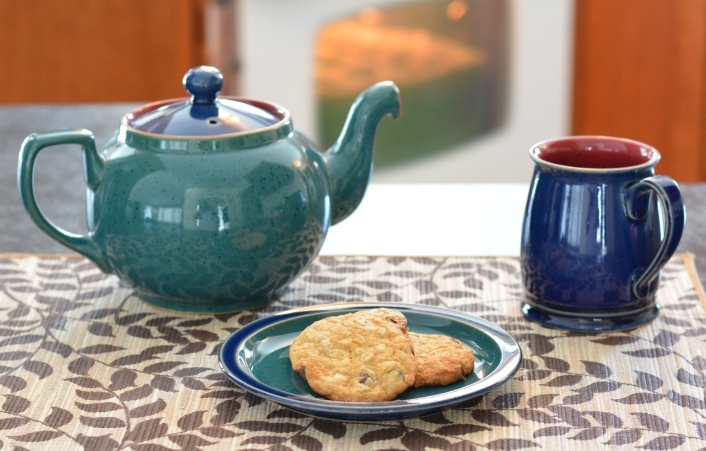 Oatmeal raisin ….. mmmmm. I love those. These ones are more of a chocolate chip type cookie.